Fingerprinting services are offered on a walk-in basis at South Sound 911’s public counter (945 Tacoma Ave. S, Tacoma) between the hours of 8:30 a.m. to 3 p.m. weekdays and Saturdays 8:30 a.m. to 2 p.m. Photo identification is required (driver license, passport, etc.) at the time of service. The public counter provides inkless (scanned) fingerprints on an FBI FD-258 card provided by our office. 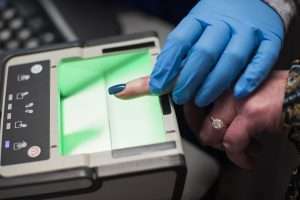 If you require ink fingerprints or need your prints applied to a fingerprint card supplied to you by the requesting agency, you will need to contact another fingerprinting service provider or visit the Washington State Patrol’s office in Olympia. In most instances, fingerprints cannot be sent electronically; the completed FD-258 fingerprint card will be provided to you. It will be your responsibility to submit the fingerprint card(s) to the requesting agency or business and obtain the proper ORI (a 9-digit originating agency identifier assigned by the FBI). Our office only electronically transmits fingerprints for original concealed pistol license (CPL) applicants, local background checks needed for South Sound 911/Pierce County employment, and for certain licenses referred from the Pierce County Auditor’s Office (taxi, entertainers, peddlers, etc.). $10 for the first card, $3 for each additional card. Cash or credit/debit card only. Fingerprinting services end 1 hour before closing.